Comfortable and noise free rooms. Staff was very welcoming. Especially Michael and Bianka always endorsed you with smiling faces. The metro station was very close and the staff was friendly and helpful. Clean room, good breakfast, friendly and helpful staff. Access to the city centre by the tram is very easy and faster than by car. Good service. Room was big and comfortable. Good breakfast and the bar had some nice Belgian beers to try. Very practical place to stop if traveling through Belgium. Location is good, very close to the Tram station and IKEA. Also the bed was very comfy! The Good: This was a nice clean hotel. We had to rent 2 rooms as a party of 4 since there were only double beds available, but that wasn't an issue. The breakfast looks well worth the price, especially for adults. We did not partake since we weren't going to pay that price for 2 kids under 6. 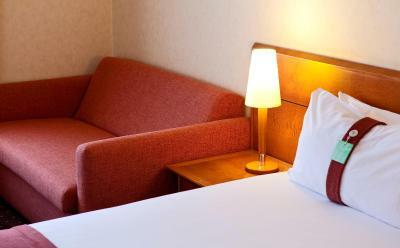 The rooms were clean, the staff was friendly and spoke English well. It was quiet. Quirky things to know: There are hair dryers in the room but they are located in a drawer outside the bathroom so they are not by a mirror. Not an issue for me, but if you need to blow dry by a mirror I suggest bringing your own. Receptionist where nice and friendly. But that is How it should be. Nice spacious room, quiet and clean. Good shower, supply of toiletries. Comfortable bed. One of our top picks in Ghent.Holiday Inn Gent Expo offers a convenient location next to Flanders Expo and Ikea Ghent, providing a restaurant and a bar, a fitness center and free wired and wireless internet throughout the hotel. 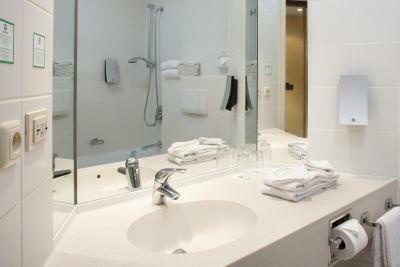 Each room comes with its own private bathroom. At the Holiday Inn Gent Expo, every unit features a desk, a TV, a radio and a telephone. The Atrium Restaurant serves contemporary food, combining light and refined meals with inventive Belgian cuisine. In the Atrium bar a selection of fine wines and a variety of the famous Belgian beers are served. At 350 feet from Holiday Inn Gent Expo you’ll find a tram stop which offers access to the historical center of Ghent every 10 minutes. The hotel is easily accessible by car via E40, E17 and A17 Motorways. 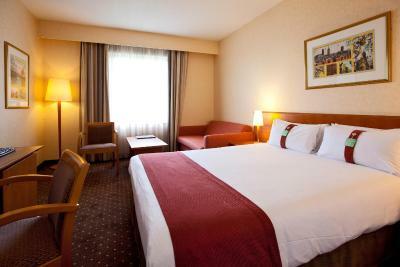 When would you like to stay at Holiday Inn Gent Expo? This family room features air conditioning and electric kettle. 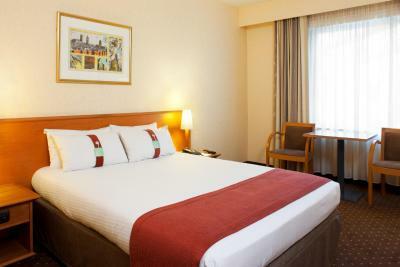 This room includes a standard double bed and a sofa bed. The room can accommodate up to 2 adults and 2 children (max 12 years). This double room has air conditioning and electric kettle. This room includes a King size bed and a sofa bed. Please note that the bed preference is subject to availability. Rooms come with 1 double or 2 single beds. Holiday Inn Gent Expo is part of PREM Group. Established in 1996, PREM Group is a fully owned Irish company in the business of operating over 35 hotels and serviced apartments across Ireland, the UK and Europe. 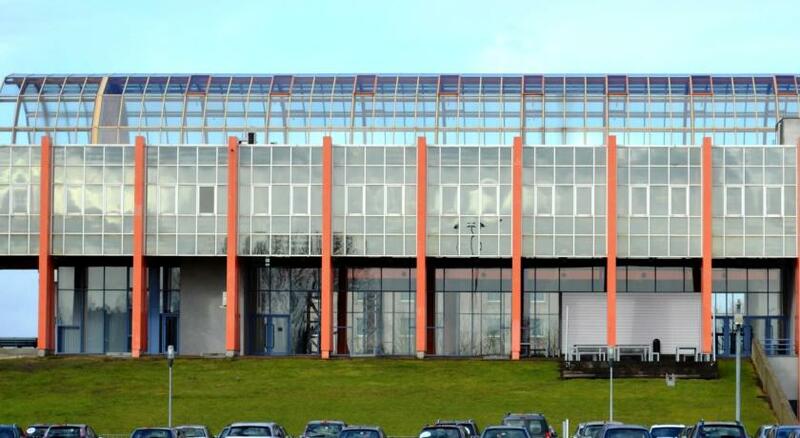 For Europe head office is located in Gent under the name PREM Group Benelux & France Division. The number one priority within each one of our hotels is our personal service towards our guests as well as our customer care. House Rules Holiday Inn Gent Expo takes special requests – add in the next step! Holiday Inn Gent Expo accepts these cards and reserves the right to temporarily hold an amount prior to arrival. Please note that children up to 13 years old eat free of charge in the hotel's restaurant when accompanied by their parents. An airport shuttle from Brussels-South Charleroi Airport to Ghent St Peter's Train Station is available 9 times every day. You can contact the hotel directly for more information. Parking is available at a surcharge of EUR 12.50 during the week and EUR 10 in the weekend. Please note that the restaurant will be closed on the 24th, 25th and 26th of December 2017 and on the 1st of January 2018. Drinks and snacks are available at the reception. Please note that from 27 until 30 December 2017 and from 2 until 7 January 2018, there is a limited menu available in the bar. On the 31st of December, a dinner buffet will be served from 18:30 until 21:30 hrs. A reservation is required. Limited room service menu Super unfriendly and unhelpful staff. Being barked at by a member of staff No sockets near the bed at all. Dear Thomas, Thank for your help with my request time time to time. I am really disappointed with the experience that we received with our stay at your hotel. When we checked in, no towels at all. Tried to call reception but no answer. Had to come down and then you sorted. One creamer for two people coffee. I had to come down again to reception as no one picked up call at the reception. Dirty bathroom, asked to refresh but didn't happen. Next day morning we got room knocked for check out... I mean we are staying for two nights but cleaner called for check out. Seems like no communication between booking and housekeeping. When we came back room was nice and tidy. Very refreshing. Soon we tried to switch on the light two lamps did not work. Tried to call reception but no one picked up a phone again. I let it go as there is no point of asking to sort this out with reference to cleaning of bathroom. Got a chipped glass too. Find the pictures for your reference. This hotel is nearly 3 star with hope. I tried to speak Alex at the front desk but he just ignored me. We had another trip planned in end of September but disappointingly we will look for something else better for our stay. We came here for a experience but with very poor service, negligence of your team and lack of hospitality made it less worth of money. Sofa bed did not seem very stable. Could have maps of other regions available. Not just Gent. I been a IHG member for a long time and it sad to hear that I can get my points. The hotel is situated in a rat maze, it takes a few confusing circles around the hotel (spiraling in) to reach to the parking lot. The large double bed we got was ~130cm wide. Not sure how tiny a regular bed would be. Our room (248) interiors looked old and worn out, bathtub's tap had rust. The room seemed pretty tiny for a family room. We were glad we only stayed there for a night. Good location very poor rooms. Breakfast great. Polite staff, comfy beds. Tram stop a stones throw away.